My husband does not like even slightly brown bananas. So when I buy bananas and they go uneaten, oftentimes they end up in the freezer. (note: I don't dislike bananas, I just tend to forget that they are waiting to be eaten.) Our freezer has a habit of spitting things out at us when we are searching for something, and the bananas were a victim. The plastic container they were in got cracked, and I started the hunt for a banana recipe. I've made muffins and the like before, but this time I needed something quicker-- having a baby in the house means baking time gets reduced. Luckily for me, the first recipe I had on my cooking pinterest board was a banana cookie recipe that boasted only three ingredients. 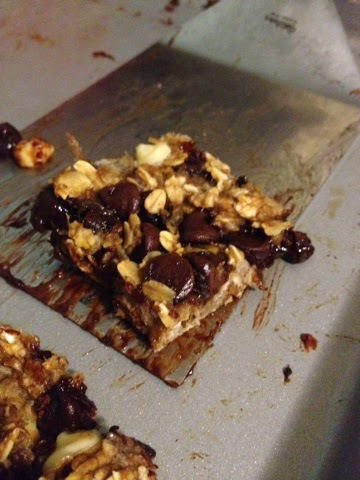 I was incredulous, but given the ingredients- bananas, oatmeal, and chocolate chips- I didn't think it could go terribly wrong. As you can see above, I didn't make cookies. 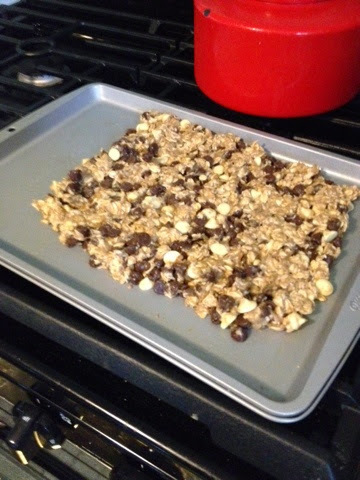 The "batter" was a bit disagreeable, so I just spread it out like a cookie bar. I also added more chips and cinnamon and vanilla, per the comments on the original recipe post. They turned out not quite what I expected, but I ate them in the span of a few short days. Several people commented on the texture, but I didn't have a problem with it. I would definitely consider making these again, especially since there is little you can do to make these "wrong".